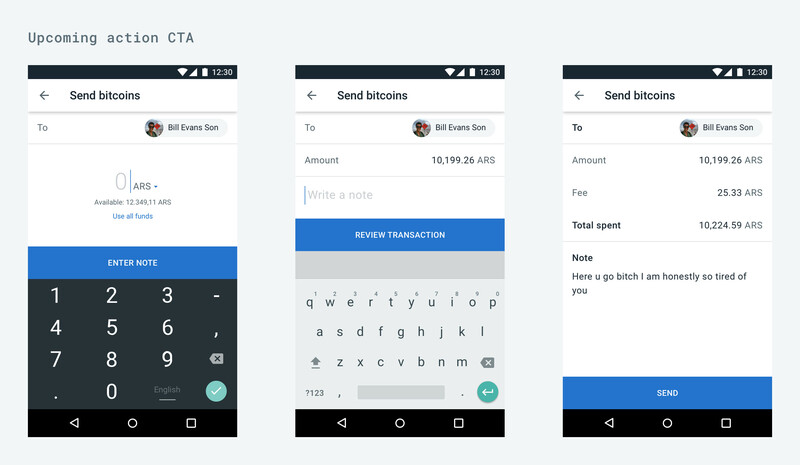 I am currently working on a mobile flow for sending money (bitcoins to be specific). I have found apps that label their CTA with the action on the upcoming screen, instead of referencing the current screen. I realized that my flow works with both approaches, so I am wondering: Between referencing the current screen/action or referencing the following screen, is there a best way to label CTAs? What should I be considering here? Attaching the flow with the two different approaches. Text buttons and contained buttons use text labels, which describe the action that will occur if a user taps a button. If a text label is not used, an icon should be present to signify what the button does. So, according to this, the current action CTA seems a better choice. The user will know what action he will accomplish by clicking the button. I agree with Aline's answer — to add something to her answer, the button label should describe what will happen when I click the button with the current state information. Showing what the next step will be looks more like a "link" behaviour, instead of a button behaviour. Not the answer you're looking for? Browse other questions tagged forms mobile mobile-application labels call-to-action or ask your own question.